If you walk too fast, you might miss it, and that would be a shame. 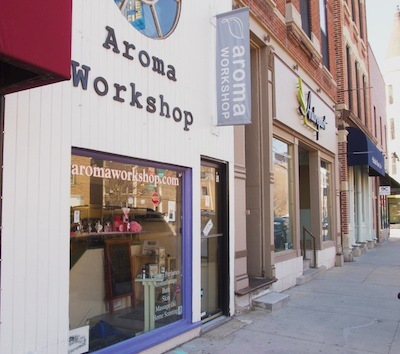 For Aroma Workshop (www.aromaworkshop.com) operates out of a small, glass-fronted store off trendy Halsted Street in the Lincoln Park area of Chicago. The delicate smell of perfumes lingers in the air as you open the door and walk down a few steps to the ‘testing’ room. 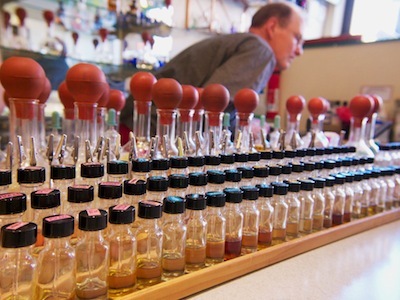 Here, seated on high stools arranged along a counter with scores of miniature transparent bottles on black wooden trays, is where clients create their own perfumes under the keen eye (and nose) of owner and former New York dancer turned perfumer Tedd Neenan. As Tedd, of Irish background and a native of Columbia, Missouri, is busy issuing guidance to clients, my companion and I spend several moments gazing around. I count over 60 miniature bottles on each of several wooden racks, each having a different oil inside, some with intriguing names: LSD, pink sugar, gardenia, honeysuckle, fig, cassis, sea mist, desert aloe, and big sun. There is also a jar of coffee beans to help clear nostrils. 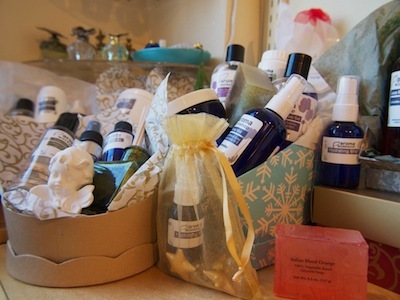 Behind us on a line of shelves standing against the wall are a wide selection of products made by Tedd and his staff — bath salts, eye creams, scrub masks, foot lotions, facial toners, and aromatherapy preparations made from essences ranging from elder flower to rose hip, eucalyptus, pomegranate, and aloe vera. Nearby are soaps of all varieties — glycerin, coconut milk, China musk, juicy peach, and white tea — as well as scent sticks. It is a veritable Aladdin’s Cave of fragrant products. Several customers are already there, reflecting wide age differences. To one side of us a middle-aged woman and four children under the age of 10 voice their delight enthusiastically upon mixing oils and smelling the results. On the other side are two men, one with an intricate tattoo on his upper arm. They sit, eyes closed, in quiet contemplation, each holding a test strip close to his nose. They’ve obviously been here a while and seem to be nearing the final, crucial stages of their personal perfume creations. Iris Lin, Tedd’s assistant, is dealing with several clients who have come to collect refills of fragrances they had made on previous visits. Aroma Workshop has hundreds of what Tedd terms ‘recipes’ from clients who regularly return to stock up on scents they had made — for deodorants, perfumes, room sprays, etc. In those pioneering days only four main essential oils were used in Tedd’s brother’s store. Tedd now has around 240 oils at his disposal here. If you don’t see Tedd merrily ‘slinging oils’ (as he terms it) in Aroma Workshop, he says he is likely doing one of several things: hanging out with his partner in Bucktown, walking to Wicker Park, cooking, shopping at Stanley’s, sitting in the first rows at a dance concert, attending an aromatherapy seminar (especially if Doctor Kurt Schnaubelt is leading it), pedaling to work, sweating at a step aerobics class, paddling a canoe in the Ozarks, or hiking in the Rockies. If you would like to purchase this article for your publication, please click here to contact the author directly or click here to contact the photographer directly.